Deborah studied painting at The Maryland Institute of Art as a Fine Art major. Her education led her to work as a freelance illustrator, commercial designer and decorator in Maryland and Florida. She was co-owner of a restaurant design firm in Tequesta, Florida and was responsible for producing the company's artwork. She enjoyed a long career as an antiques dealer, specializing in 18th and 19th century American paint decorated furniture. She assisted in the conception and production of the Annual Center for the Arts Antiques Show and was a founding member and president of Gallery 14 in Vero Beach. For 22 years she owned and operated Winter Beach Farm, a seasonal horse boarding facility, specializing in the "Equestrian Art" of Dressage. The dogs, horses, and people that surrounded her in this environment provided a constant source of inspiration for her paintings. Deborah and her husband had a second home in Taos, New Mexico, and it provided inspiration for her abstract pieces. Deborah's paintings have been collected nationally. Her exhibitions in Florida included Gallery 14, Jill Pease Gallery and Teaching Studio, the Indian River County Courthouse and County Building, Backus Gallery in Ft. Pierce, Vero Beach Museum of Art at Art by the Sea and the Faculty Show, and at 5th Avenue Gallery in Eau Gallie. She exhibited at Polk College's Fine Arts Museum in Winter Haven, at 1090 12th Street Gallery, Intrepid Fine Art Gallery, Palm House Gallery in Vero Beach and Cristina de la Vega Studio in Stuart. She has exhibited with Nina Torres at the International Art Exhibition, during Art Basel in Miami, at Tiger Lily Studios and with Meredyth Moses at Meredyth at the Millers in Vero. She was a contributing artist for the Turtle Trax project, which benefited the Mental Health association. Other charities include The Environmental Learning Center, Quail Valley Charities, The American Cancer Society, Special Equestrians of Vero Beach and the Humane Society of Vero Beach and Indian River County. She taught intermediate and advanced classes and workshops at the Vero Beach Museum of Art for four years. In November of 2015 she opened her own studio, STUDIO Deborah Gooch. It is located at 2304 7th Avenue, Vero Beach. 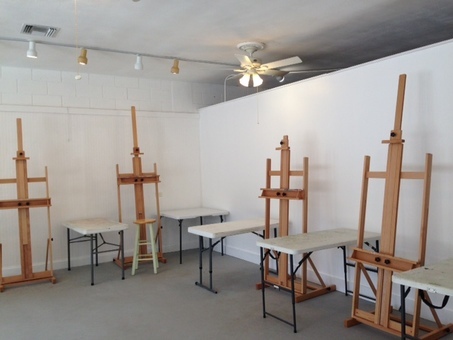 This space is her working studio and it hosts her continuing classes, workshops, and salon.